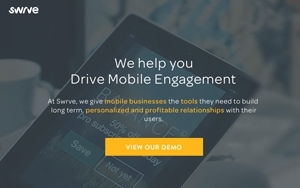 Swrve, a mobile-marketing platform, has announced a new function that will allow marketers to pre-define audience segments and send them push notifications quickly. The new functionality will enable companies like broadcasters to send out reminders that a show is starting. Research shows that additional viewers can be gained by being reminded two to three minutes before airtime, says Swrve CMO Martin Doettling. The notifications must also be adjusted for time zones, and be precise with timing, or users may forget or may not have time for the new show. In the UK and EU, where horse racing has a large following, last-minute changes to lineups or weather conditions can completely alter the odds of a race. The ability to receive a push notification through an app can allow users to alter their bets to adjust to the changes. "Timing is of critical importance to our team, as push notifications need to reach our customers before the race gets underway, regardless of audience size,” stated Jack O'Reilly at Racing Post. Swrve had huge growth in 2015, with 300% YoY growth in new bookings and a 280% increase in YoY overall business. The company processed 271 billion user events last December, or about 8.5 billion events daily.